Thank you to the readers who have contacted me to highlight errors or omissions in QF32. We had great difficulty compressing the QF32 story into a form to suit a wide audience. Too much happened on the flight to fully document in a broad-appealing book. I need more than two and a half hours to tell the details of the QF32 flight and aftermath to a rated and current A380 pilot. My initial 130,000 word submission was too long and technical. The editor (correctly) amputated chapters and massive blocks of text. Please submit any errors or omissions – all correspondence is appreciated. The reprint status is shown on the third line on the page following the QF32 title page. Wings Parade, 1979. It’s a small world. Air Chief Marshal Sir Wallace “Digger” KYLE GCB, KCVO, CBE, DSO, DFC, KSJ – a West Australian rose to become the Vice Chief of the Air Staff (RAF) and later the Governor of Western Australia (1975-1980). He served in the RAF Flying Training Command in May 1940 under my great uncle, Air Vice Marshal H.V. “Vivian” Champion de Crespigny (see Chapter 2). I had ordered on line and received 2 issues of QF32 which is now rotating amongst my aviation friends in Slovenia. It reads of course like a Hitchcock suspense thriller. This aside I had been made aware by my ex TN/QF friends (I am ex DCA/TN/QF Staff) that another book is in the works: “Handling the big jets”. When is this book coming on the market…? I am in the final throes of my next book that will be out in September. I will then spend 6 months to finish the Big Jets book (that was 30% complete when interrupted by something). If you subscribe to this blog then you will be kept informed. Looking forward to the Big Jets book, Richard. I’ve only just now noticed a little detail here. On page 149, when Matt is requesting pushback clearance, it says Bay Charlie 23. But at the top of page 295, it says “…bay Charlie 32, the gate we’d departed from more than four hours earlier”. That’s not the same number. On page 334 of Richard’s wonderful book QF32 it states David didn’t pass Richard’s route check. I cannot understand why given Richard’s outstanding leadership qualities displayed and actions taken on this flight. Maybe I have missed the point somewhere but would appreciate if this decision could be explained please. I would love an explanation of this too. I imagine it will be some ‘technicality’ like ‘did not complete flight to planned destination’ – despite doing the most amazing flying in its place! Richard, I agree with you. I don’t believe the use of the term ‘joystick’ commenced in the computer era as my brother learnt to fly on a Victa Airtourer in the 1960’s which had a joystick instead of the normal flight controls which were used on Cessna 150’s etc. Its seems that French pilot, Robert Esnault-Pelterie, the inventor of the single control column system for aircraft in the early 1900s, may have used the term. However, Robert Loraine apparently coined the term in his diary when he went to Pau to learn to fly at Blériot’s school. The name came via the term “George Stick” from A.E. George. Page 3, bottom: “I turned back (…) my hands around the joystick.” It’s about the Winjeel, designed and build in 194x. To my knowledge, the term “joystick” comes from computer lingo, and I doubt that it was 34 years ago already used as a synonym for “control stick”. Thanks for your feedback Wolfgang. I will research it further back in time, but suffice to reply that I and my compatriots used the term “Joy Stick” throughout my time in the RAAF in the 1970s and 1980s. Self correction to “joystick”: The name “joystick” is thought to originate with early 20th century French pilot Robert Esnault-Pelterie. The use of the term “joystick” in connetcion with the Winjeel is correct. I have always been an ‘Anti Airbus’ armchair pilot! I have heard so many negative comments from close relatives who fly for airlines about Airbus products…the pick of the comments is “In Boeing the computer helps the pilot fly the aeroplane – In an Airbus the poor blahdy pilot helps the pilot fly the aeroplane”. Subsequent ‘incidents’ with Airbus all over the world seem have born this out…there have been some real horror stories about ‘computers taking away control from pilots’ or on board computers being compromised by ‘sticky’ pitot heads etc. Consequentially, I have avoided Airbuses like the plague!!! Previous ‘incidents’ with QANTAS 330s etc. have reiterated my firm belief that the Boys & Girls who fly for QANTAS will always get errant airplanes back on the ground, right way up, passengers safe & sound! I am now a convert to Airbus, but I will stick to flying with QANTAS…just in case! I was an honorary member of 77 Squadron and AVIOR for a while. I am a Military Historian. Ex Artillery and Armour. I am glad after reading my book, that you have improved your impressions of, and reduced criticisms about automation on Airbus aircraft . Having flown and researched both Boeing and Airbus aircraft for 27 years, I understand the history and legacy designs for jet aircraft. I also appreciate why passengers and pilots can be skeptical of aircraft designs that they have not researched nor flown. Boeing aircraft evolved from cockpit standards and designs proven during the second world war. Airbus took advantage of being a late entrant into aviation. Airbus designed truly revolutionary aircraft using the latest disruptive technology – computers. If I was given access to 1,000 computers and told to design a new aircraft, then I would probably build an aircraft very similar to the Airbus designs. Many of my aviation friends also share these views. All complex high technology machines that operate in a high risk environment MUST be flown and commanded by well trained, knowledgeable and experienced pilots working in effective teams. Thus the best reviews and comparisons of Boeing and Airbus designs come from professionals who have flown both types. At the end of the day I hold the highest regards for all Boeing and Airbus aircraft. All new Boeing and Airbus designs now incorporate similar and impressive automation capabilities that have made aviation progressively safer for the flying public. Indeed my Big Jets book will explain why (despite the stories from FBW skeptics) Boeing and Airbus Fly-By-Wire aircraft are both about nine times safer (based on hull losses) than non FBW aircraft. I love the A380 and couldn’t wait for them to be cleared to fly asap after the QF32 event as I was booked to fly on one to London in mid-December 2010. Pity the CVR only looped the last 2 hours of last running engine. Why can’t a modern aircraft like the A380 have a CVR that records from first person in cockpit to last person out? Surely there is technical ability/capacity? Is it some kind of privacy thing agreed with pilots? The 2 hour ‘limit’ has foiled several air crash/incident investigations. When will it / can it / be extended? I hope you and yours are well and happy. Dear Rupert, thanks for your kind words. All the pilots and passengers were very keen to get back into the A380. In fact I think that the A380 has now been stressed tested more than any other aircraft, so it’s reputation of redundancy has been proved. Indeed I imagine that Airbus sales people do not get asked how resilient the A380 is any more! I believe that the industry is now moving to multi-channel CVRs that must cover the entire flight duration. This is no longer a technological challenge so we should see improved CVRs fitted soon. Thanks for your definitive reply about the correct technical name for the Trent 900 – (RB 211 Trent 900). I was previously more suspicious of Wikipedia but use it more often these days but only with a proper sense of skepticism. Their entry on Rolls Royce is much more historical and informative for general reading than the Rolls Royce website. Indeed, a search of the Rolls Royce website would probably lead a “reasonable person” to conclude that the RB211 and the Trent 900 are not the same engine and as you point out the RB -211 prefix has finally been dropped with the advent of the Trent 1000. As a lapsed private pilot who likes to “fly the computer” your book (QF32) was very helpful during our session on the A-320 simulator at Bankstown recently in describing certain aircraft features such as auto trim. I too, loved Richard’s book. And I too, would love to know why he “failed” his route check! Huh? If that’s failure, the Qantas standards must surely be set too high. Also, Richard’s consideration of the climb to 10,000 feet may have been the only thing to save the aircraft if all engines had failed. Wikipedia says the RB 211 was officially superseded in the 1990s by the RR Trent family of engines, the conceptual offspring of the RB 211. What amazing machines they are anyway !! I will never trust Wikipedia as a valid reference. So in summary, the RB211 is a three spool specification (first bench tested in 1968 and flown in 1972) that has persited to this day. The Trent is just a development from that spec. Again, thanks for your comments Mark. A truly remarkable feat and an incredible story making a great read! I’m not an avid reader, but couldn’t put QF32 down on a recent holiday in Bali. I’m actually a Captain, be it of the Marine kind, and your book brings similar incidents to mind. Although I’m not in danger of falling out of the sky, similar issues arise and I’ve been confronted with being lost at sea. My sister has been a dedicated Qantas employee for 29 years now, still going strong, so I have a soft spot for the company. Well done with the recent success of the book, and may the future bring you and the team of QF32 lots of happiness. We aviators, astronauts and nautical types all share a common bond – for we are a band of brothers having fate as the hunter and we understand that our survival relies on the other extraordinary people in our crews pooling their knowledge, training and experience such that we can survive the unexpected and unthinkable events that nature and high technology occasionally thrusts at us, usually at the worst times when the checklists have been “sucked out the window on a dark and stormy night” and when our friends and support are too far away. I’ve had allegiance to sea-air-space my whole life. Coral and I created our first company in 1986 “Aeronaut” (Aero.. Naut..) that persists today. Congratulations on the book award and to you and your team for averting a disaster in the first instance!! I thought that while the Trent series engines are descendants of RB-211’s they are not the same…..
Hi Mark, Thanks for your kind words. What page are you reading re the RB211? The Trent 900 is one of five Trent instances of the RB211 object (specification). Does this description satisfy you? You’ll have to wait for my big jets book if you want to go deeper. QF32 was a fantastic read. Thank you very much for the insights it contains and the openness with which it was written! I’m looking forward to the blog update about your route check. One very small correction – P204 line 7, I assume “flight desk” should be “flight deck”? Absolutely correct Mike! Thank you for your help correcting the errors! I’m interested to hear in the follow-up report about the “I didn’t pass” comment! Great flight! Great book! This comment is a bit trivial but at page 145 you said “I don’t wear a watch”. Then at page 293 you wrote: “I looked at my watch”. As a retired Aviation Fire officer I was very interested in the whole event. When I heard the story on “60 Minutes” I could not understand why the passengers were not evacuated immediately. As a firie this is the understanding that once the aircraft stops then the passengers normally are expected to evacuate immediately. When I received and read the book I understood your decision. I appreciate that it is the captains decision when to do so but I consider that in these circumstances that control of the evacuating passengers would have been in the hands of the cabin crew on the ground and airport staff. But as is stated the decision was made and it worked out well so who could ask for more. There was a sequel to this “incident” when we wanted to reproduce the incipient failure on the test bed, with temperature and vibration instrumentation installed on the No 5 bearing. The bearing cage had been cut to make it happen and the test instructions were to shut down immediately the temp went above a certain figure. But the test crew must have gone to sleep on this one. So the failure was fully reproduced, the turbine wheel came out sideways and ran around the cell until it broke through into the adjacent cell and smashed a Sapphire engine to pieces! As they say, “.. the best laid plans of mice and men”! In about 1964, when I was still an Engineering Cadet with Bristol Siddeley Engines, the RAFs Vulcan bomber was powered by four twin spool Olympus engines. Aft of the combustion chamber, an intershaft (number 5) bearing was located between the HP and LP shafts. This bearing was lubricated from the very end of the shafts, a marginal situation by any standards. When the lubrication failed one time, the bearing overheated and the shafts went plastic, resulting in a turbine wheel (I forget which one) exiting the aircraft through a big hole! Some Vulcans had a periscope for the flight deck to view aft, but not this one, so they were unaware of the damage. The crew attempted unsuccessfully to re-light the engine, before landing safely. There was negligible secondary damage to the aircraft. Just thought you might find this interesting. Thanks Mike, this is very interesting. There is a lot of thought put into engine design using every bit of knowledge and experience gained since Frank Whittle fired up his first jet engine in 1937. On page 256, it should be “Kai Tak”, not “Kai Tac”. Thanks for writing such a thoroughly engrossing account of this incident! Thank you Captain de Crespigny (and your crew) for your remarkable effort, and thank you for a wonderful refreshingly frank book. I predict many reprints. Page 283 9 lines from bottom may have an example of misinterpreted dictation – “faulted” for “faltered”. Ian thank you for your kind thoughts. A fantastic read and a wonderful story of CRM as well as supreme pilotage. I am unsure by what you mean by “Twin turbo-charged” when referring to the Trent 900 in the appendices p. 350. In the narrative on p. 152 you say “…each engines’ bleed valves closed to engage the 113,000 horsepower turbochargers.” Would not they be classified as “Turbo fan” engines and the fans were engaged by the bleed valves? The Trent 900 is a three spool engine. The Low Pressure shaft is driven by the LP Turbine, and drives the Fan. There is no engine compression benefit from the fan. The intermediate and high pressure compressors are driven by their respective turbines mounted on independent shafts. These two compressors have bleed valves (called wastegates on turbocharged cars) to match the inter-compressor flows at low speeds and to prevent the engine surging during deceleration. So, if the bleed valves are open whilst the engine is at idle prior takeoff, then they close (and the Variable Inlet Guide Vanes (VIGVs) open) as the thrust levers are advanced and the engine spins up to achieve takeoff thrust. The bleed valves remain closed and the VIGVs remain open when the engine is in a steady state above medium thrust levels. I hope this helps. The following graphs are a more complex, but summarise the effects of Bleed Valves and VIGVs on the “working” and “surge” lines. What a fabulous book, I thought it was inspiring. You managed a extremely difficult situation and delivered a first class result. As a dedicated Qantas flyer, reading your book reinforces my belief’s that I always fly Qantas because you know the the “guy” up front is the best trained pilot in the world. It was great to see that some of your RAAF training also kicked at the right time. The outcome you delivered will no doubt be recogonised a one of the greatest aviation feats as the damage to the aircraft is really difficult to appreciate with so many systems out or degraded. Congratulations to you and the other team members. Hi Brendon, thanks for your kind thoughts. I am very proud of the crew and will pass on your comments. The answer to your question will be published later. Please follow the answers by completing the info at “FOLLOW BLOG VIA EMAIL” at the top right side of this page. 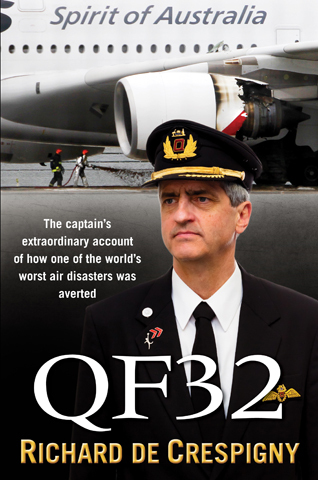 I have just finished reading QF32 – a wonderful read, particularly for a nervous flyer. I have taken a lot away from your account but mainly: unreserved praise for the whole crew, I will not be afraid of flying again and always fly Qantas if I can. QF32 should be a compulsory ‘text’ for media commentators to show them why we should all support our national carrier. Linda thank you very much for your kind words. I am thrilled that nervous fliers can get some relief from my book. Thanks also for the correction. Just when I thought it was almost correct! I will post the complete answer to this shortly. Please register for the answers by selecting: “FOLLOW BLOG VIA EMAIL” at the top right of this page. I’m a former editor, and I didn’t pick up any of the items listed here. I was too engrossed in the story. Thank you for this brilliant account. I am in awe of the professionalism of you, your crew, all involved in this event, and the designers and engineers at Airbus and Rolls-Royce. I was fascinated to read your account as I have spent a large part of my working life as one of the many software engineers working on various incarnations of Trent EEC. I was staggered to read of your inability to shut down engine 1; having written some code for the master lever and knowing that it’s available via discretes to both EEC channels AND over ARINC AND it’s directly wired to the HPSOV anyway…incredible that so much redundancy should be wiped out. So many questions; so little time! I think another reader has suggested a similar idea on the website but a more detailed account would be fascinating – a “director’s cut” if you like or even a detailed audio version of it, narrated by your good self, would be fascinating to listen to. Above all though, congratulations to all involved; you all richly deserve the praise you are receiving. Anthony thank you for your kind thoughts. Perhaps the full extent of the damage has not been fully exposed yet. As per page 318 “[the ATSB report is] guaranteed to be a fantastic read with many surprising revelations”. 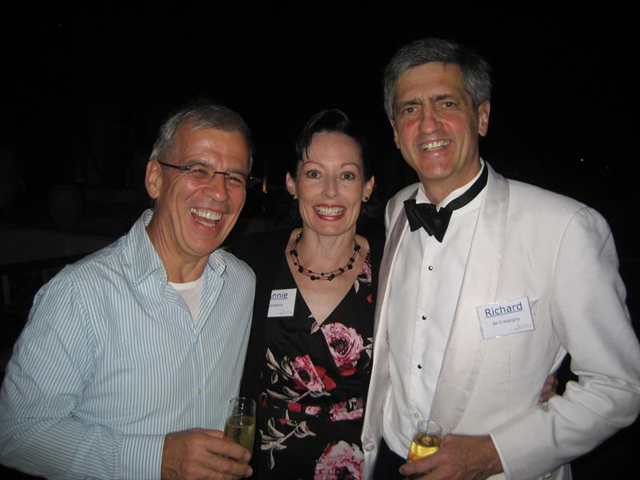 As a ex RAAF Medical Assistant i worked out that there were a few places where we may have crossed paths in the past. Your book is an outstanding read. A thing that the RAAF taught me is preparedness to put steely focus into critical situations. Thanks for inserting your comments re PTSD. No person should feel without help when it is needed. Just wondering about airspeed limits page 348.. Vmo/Mmo 310/0.89? should that be 510/M0.89? Hi Richard, I just love the book. Been flying lighties for 20 years now and represented Australia in formation flying (not in Macchi jets though). I noticed some of the errors above and just wanted to point out what is not an error but is more a spelling argument. I think the most accepted spelling in English (not US) is “ageing” not “aging” as spelt in P86 in regard to B747 Classic engines. I am a pilot not an Grammarian. So I have passed this to Pan Macmillan for consideration. Their verdict – you are correct. THANKS FOR YOUR FEEDBACK! Last photo before p279. Not an error per se, but it would be good if the aircraft was a Qantas A380 rather than SQ. There is no ‘100’ on page 162 ! Thanks Grge. We had found the error earlier but I had forgotten to included it in the Errors & Omissions list. All fixed now! Thanks.